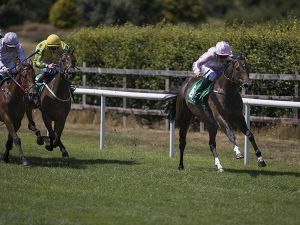 The regally-bred FANTASY broke her Maiden at Navan and in the process earned a £25,000 October Book 1 Bonus for connections. Her victory, along with a Plus 10 Bonus meant she collects €47,845 for her victory. FANTASY was bred by Trevor Stewart out of his star mare CASSANDRA GO and was offered at Book 1 of the Tattersalls October Yearling Sale by Ballyhimikin Stud. The daughter of INVINCIBLE SPIRIT, who is a half-sister to multiple Group 1 winner HALFWAY TO HEAVEN, was purchased by MV Magnier for 1,600,000 guineas.